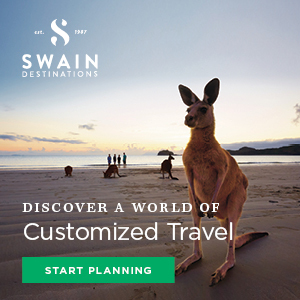 Tapping In is the result of nearly 30 years of spanning the globe, searching for the happiest people and places on the planet for Swain Destinations, the customized travel business, Linda and her husband, Ian, built together. Tapping In also combines Linda’s passion to share the stories of others through television. She has previously done this with her first series, “Moms on the Move,” that began on NBC 10 in 2002 and subsequently aired as an audience show in syndication across the United States. Linda has received local Emmy Awards for Outstanding Program Feature and Best Show Host for her work at NBC 10. She recently received a Daytime Emmy Nomination for “Tapping IN” The Happiest People and Places on the Planet . Also a songwriter, she executive produced the IMAX signature movie “Home of Freedom” based on her anthem for Philadelphia that was featured at the Franklin Institute. She has been recognized as one of Pennsylvania’s Best Women in Business by former Governor Tom Ridge and honored by the March of Dimes as the “Citizen of the Year” presented by Governor Rendell for her work in television. She is an active board member of Arthur Ashe Youth Tennis and Education. An alumna of Fordham University, Linda is a mother to six children.